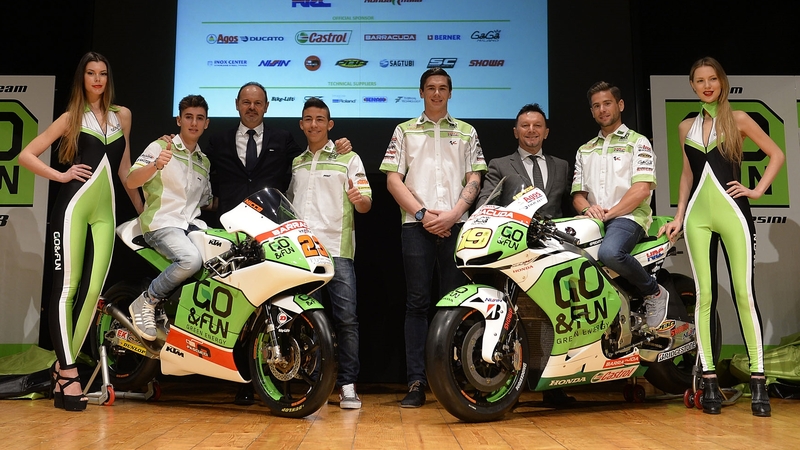 Today, at Titano Theatre in San Marino, has been officially unveiled the Team GO&FUN Honda Gresini for the 2014 MotoGP World Championship. On the stage, GO&FUN President, Bruno Bollini, the Team Manager Fausto Gresini and the riders – Alvaro Bautista and rookie Scott Redding — unveiled for the first time the new livery of the two Honda MotoGP machines that will be used during this season: the Factory spec RC213V for Alvaro Bautista, and the brand-new RCV1000R to be used in the newly formed Open category. “We expect to enjoy a really nice season in 2014, with a lot of good results. During last season progress has been clear, creating the basis for a future that may lead to great achievements and satisfaction: for this reason I am confident that our partnership will live a further growth this year, for an inevitable success. The arrival of Scott Redding is a good injection of energy: I’ve been following him for two years, and I like him a lot. On the other hand, Alvaro Bautista has already proved to be a top rider, being able to stay on top at almost every race last year. We expect a further improvement from him, with the ambition to step on the podium many times. We have the energy and the enthusiasm to reach this important goals”. “2014 is a really important year for Gresini Racing: first, it will be our 18th year in the World Championship. An important goal, thanks to which we can say with pride that our organization has… become of age! GO & FUN will continue to instill in the Team the incredible energy and dynamism that we’ve enjoyed throghout 2013, and in this season we want to be on top with both riders. Alvaro deserves to be put amongst the ‘top riders’, having already proved to be able to get a top five finish at every race. This year we expect a further improvement from him, hoping to attend the podium frequently. On the other hand, we have high expectations on Redding’s debut . Scott is young, but already very experienced: I like especially his attitude, because he never gives up. Our goal with him is to come out on top in the newly formed Open class”. “I’m really happy to be here again for the third year running! The Team GO&FUN Honda Gresini is like a family for me, and I always enjoy a great atmosphere inside the garage. Unfortunately, last year we missed to step on the podium, but starting from mid season, we were able to be more competitive and to show a really good consistency. We achieved good results thanks also to the good work made by Showa on the suspensions. I battled in many races with Valentino Rossi, who was riding a full factory bike, so we are really optimistic ahead of the forthcoming season. We know that we have a good base, so my goal is to be competitive right from the start, at the first race in Qatar”. “Everything for me is completely different here: it’s a new challenge, which is what I like! All the guys at Team GO&FUN Honda Gresini were really nice, very welcoming; so I felt pretty comfortable right from the first day of testing in Valencia last November. Now I’m hungry to go to Sepang to start the season; I’ve been training hard because I want to come to these three days of testing really strong and fit. Now my wrist is pretty okay to ride properly. I will go in Malaysia just to see how it goes, but also to try to close the gap on the front guys and also on the other Production Racers. Anyway, my goal for this season is to be the first Open class rider”.